I had a great day this week on a Rider Psychology for Coaches course at Wellington Riding with Flying Changes Coaching. This is really important training for coaches as this type of thinking puts the rider at the centre of things, which is what good coaching is all about. Learning more about psychology is also helpful for riders in order to see a problem from a different angle. I have summarised (and in some cases expanded on) some of the topics from the course. A rider’s motivation is built on an equal balance of Skills and Beliefs. In an ideal world, a rider is self-motivated to work and progress and their self-belief is balanced by their skill. In the first diagram you believe you can do something, you have the skills to do it and you are motivated to progress. However, things can get out of balance and the picture below is a common scenario. If the rider lacks confidence and does not believe in themselves then they are not motivated and, even if they have the skills, they cannot achieve their goals. Whatever you believe to be true is reflected in your body and your behaviour. For example, if you think that your left leg is not able to deliver a leg cue effectively (because someone told you that once, or because you had an accident or because that was the case when you were a child etc., etc.) then this becomes a belief and you don’t even try to use your leg effectively. So the mind affects the body which in turn affects the horse. This cycle works the other way around as well. If you are worried about the neighbour’s noisy peacocks then your concern about them leaks to your horse who spooks, impacting on your balance and reconfirming your way of thinking. So often riders are really worried about making mistakes. Its really common to hear “I really don’t want to make a mistake with this young horse” or “I didn’t try it because I was worried I would get it wrong”. However, the truth of it is that you have to make mistakes, or you will never progress. In the picture below, the journey to mastery starts at the bottom of the drawing and Mastery lies at the top of the picture. The fastest way to get to Mastery is travel upward along the central, vertical line but in reality learning takes place along the wiggly red line. 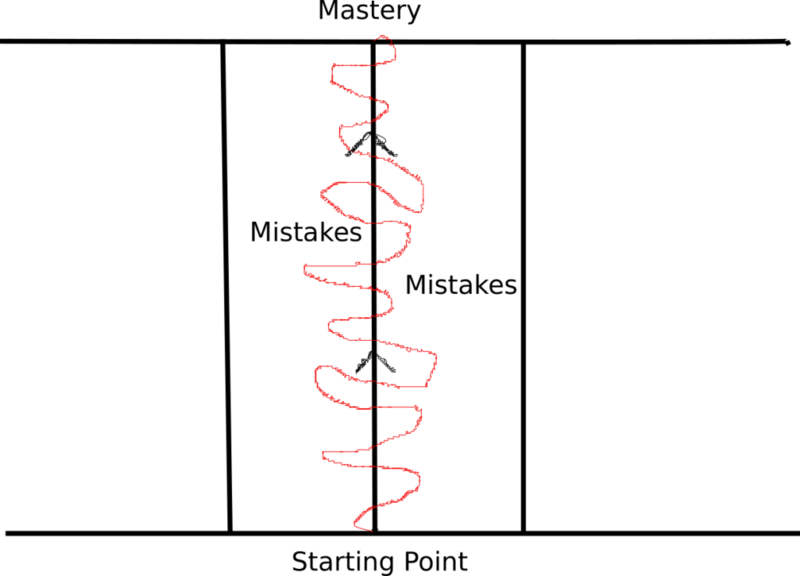 Mistakes are inevitable in the learning process and you learn from mistakes and adjust back to the central black line. If the mistakes are too big then you can get despondent, this is represented by the areas further left and right of the mistake zone. A coach wants to keep riders out of despondency and encourage them at accept mistakes and guide them back to the most efficient path. In his book, The Talent Code, Daniel Coyle discusses the idea of “deep practice,” which is the process of stopping, stumbling, and working through mistakes. To improve performance, or learn new skills, we must give ourselves permission to make mistakes and learn from our errors. Deep practice forces us to slow down and, as Coyle states, “operate at the edge of your ability.” This is essentially the biggest difference between effective and ineffective practice. Effective practice requires us to examine our weaknesses with a large magnifying glass and patiently seek solutions. Don’t just practice an old belief or skill, make sure that the practice you are doing is of the skill you want, rather than the one you don’t want. Poor practice will simply reinforce a poor skill. In the central “safe zone”, in the diagram below, everything is comfortable for the horse or human. This is comfortable and safe but we don’t grow or develop in the safe zone. In order for growth to take place we have to move out into the stretch zone. The inner part of the stretch zone feels OK but the closer we move towards the black area, the more difficult it becomes. You don’t want either horse or human to cross over into the “death zone”. This is a frightening place to be and horse or human could quickly become sensitised to the activity or challenge. Sensitisation means that an animal learns to react more often or more strongly to a repeated stimulus. If this happens repeatedly he will avoid the problem or refuse the challenge. In relation to a horse, an example could be that he was ridden out too far and too fast on his first hack away from home (too big a stretch) and then spooked very badly when he met some horses cantering towards him. He continued to be frightened for the rest of the ride and returned home without having relaxed. 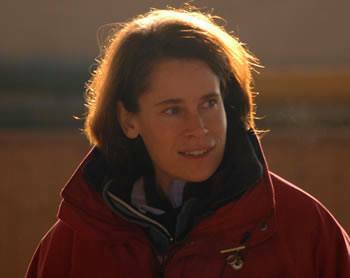 If something similar happens the next couple of times he goes out, then within 2 or 3 rides he becomes sensitised to meeting other horses and, if the problem is not resolved, its likely that he would start to associate hacking in general with what he considers to be a trip into the death zone. This sort of problem can be time consuming and reasonably difficult to fix. It would be much quicker and easier to have broken down the task of getting the young horse used to hacking with much smaller and quieter steps. Another way to think about the stretch zone is that each time you go out for a hack you only want to go 10% of the way into the stretch zone. A calm and successful training session, where the horse is stretched (but not frightened) is like making a deposit into your bank account. You want to have a dozen rides that are “bankers” where you effectively deposit money into your account. Then when you are a bit further from home, and you meet the rider who canters past you, then you have enough money in the bank account to be able to cope with the sudden “withdrawal” caused by the situation. 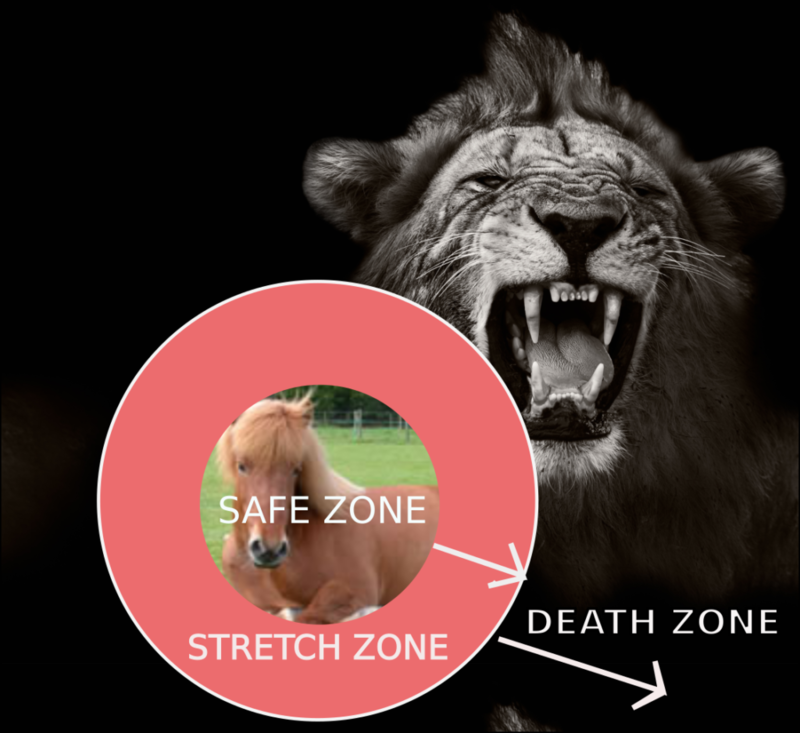 Your stretch zone has increased in size by your patient work and you can cope with a new situation without going into the death zone (and experiencing the unpredictable, instinctive behaviour that your horse is sure to show you when he is there). If we consider the situation for a human, an example could be a coach encouraging a nervous jumper to jump a 60cm course of jumps. This seems like a very small course to the coach and he persuades the client to have a go a 70cm course in a competition. She is now getting really nervous and has a fall. It is quite possible in this situation that she won’t jump at all next time and will opt to focus on flat work because, as far as she was concerned, the show jumps pushed her out into the death zone as it was too much stretch too quickly. This is a model I know well and use frequently when talking about a horse or a person. You can also use it to think about the relationship between the horse and the human, you might have a very confident human on a nervous young horse who would quickly take the horse out into their version of the death zone. On the other hand, you might have an experienced school master with a nervous rider. Now we need prioritise the riders’ needs when considering what sort of stretch to set, no matter what we know the horse to be capable of. On the coaching course it was a really nice addition to talk about the importance of adding a stretch that only goes 10% into the stretch zone. Anything more than this can be too much. Starting with a stretch of 50% is not nearly as constructive from a learning point of view as going 10% of the way out. So, as a coach you need to judge the stretch to be (a) starting from the right place, at the edge of the safe zone and (b) the appropriate sized stretch. The result of overload is that the comfort zone actually gets smaller. So, change just one thing at a time; change the environment, change the level of the work or change something about the horse but not all at the same time or you can’t deal effectively with the unknown element. The words you use are incredibly important, it was good to spend a little time looking at this topic. Avoid using the word no or don’t. The brain can’t process don’t, it has to think about the thing we are not meant to do in order to not do it. This means that far too much energy has gone into that thing and we have probably just done it anyway. It would be so much better to say what you do want rather than what you don’t want. All of these words or phrases indicate a lack of belief in the plan or idea, be aware of them in your own and other people’s language. Also watch out for the word ‘But’ as it negates whatever precedes it..